Small upholstery tacks being thrown on the road in Kew was first reported on the Bicycle Network Victoria forums on February 23rd. Reports of more tacks have continued on a regular basis over the past 10 weeks. The issue has been given attention on TV, radio, and in the local papers. Yet the problem persists. At the risk of giving the culprit more attention, I thought I'd document my adventure today and a few links to help people report/discuss their encounters with this menace. On May 2nd I picked up 242 tacks. The following day I picked up another 192 with the help of a few magnets. Others have collected similar numbers off the road in the past few days. This report is far from an isolated case. Police - Boroondara Police Station would not take a report or the tacks when I attended the station in person. They were aware of the incident but would not do anything, other than 'patrol the area' until the culprit can be identified. 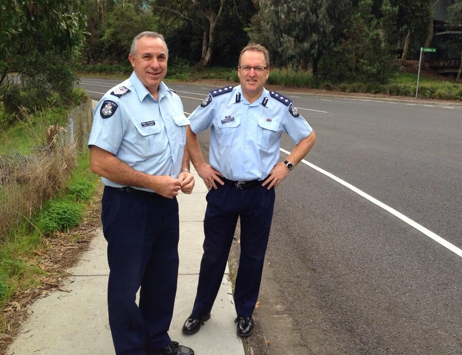 May 9th Update - I met two police officers on the boulie who had found tacks themselves, on the footpath and road. They asked for my photos of tacks collected which I emailed. Good to have these guys on the case! City of Boroondara - I reported the May 2nd tacks via Snap Send Solve on my iPhone with photos and a detailed description. I had a phone call within 2 hours from Matthew from CoB who thanked me for the report. They are also aware of the issue and are passing these reports onto VicRoads who'll act on them. This may be in the form of a big magnet-roller... not ideal, better than nothing. Bicycle Network Forums - While I can't encourage community pitchforking (much)... We can warn others of recent tack drops, times, and locations. If only to serve as a warning for others to take another route on their ride/run/walk. BNV Forum topic link. Social Media - As above. It was a post by The Ride Cycles that I saw this morning that got me down there to see if I could do anything. As I've mentioned, the downside could be that the culprit is reading these posts and enjoying their work. After 10 weeks of menacing Kew, and no end game in sight, I encourage anyone who encounters these tacks to report it. Snap Send Solve would be the most appropriate. Warning others via social media is your call... we really don't know who we're dealing with. Because why not! 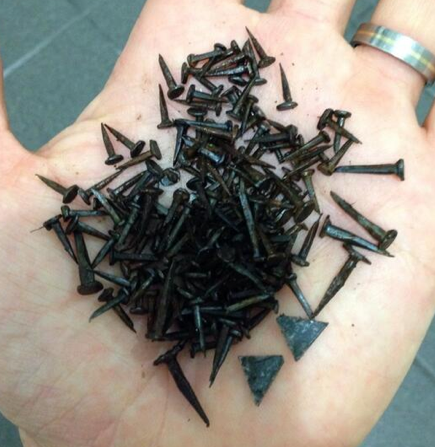 :) The spread and location of the tacks indicated they were not thrown by a pedestrian. A lot were scattered into the gutter as if they were thrown from the road. Next, I think it would be difficult (though not impossible) for a car driver to throw these alone. The tacks appeared to be spread in a way you'd expect from a low speed ~30km Trevor Chappell underarm delivery, from the passenger side of a car, or motorbike, or push bike. Reports of more tacks near Yarra St. Map above updated. Below is the loot found on the road and footpath at this location. Reported again to CoB. 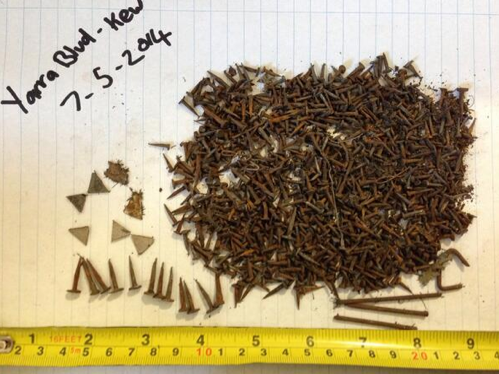 May 6th - Larger tacks and metal shards located on road and footpath. May 7th - Tacks, nails, metal shards. The thing about CSI is that they really really care. When the cops really care they can move mountains. As a nearby local cyclist I have witnessed an exponential growth in early morning cyclists and a much greater tendency to venture into side streets in the early morning in large groups e.g. Yarra St or Main Dr. There is a lot of chatter in these groups and I wonder whether some resident has grown tired of the noisy early morning chatter in residential areas. No excuse for dropping tacks but there must be a reason for such a concerted effort. For me I keep riding it but don't use the bike lane, straight up the road until this is resolved. Yikes! At least those runners weren't Vibram Fivefingers! Good work picking up the tacks over the weekend- funnily enough I spotted you on the boulevard doing what appeared to be scrapping a bag of tacks across the bike path. I was pretty close to calling the cops before I realised you were picking them up rather than dropping them. Anyway, nice work. Thanks for your fine work picking up the tacks. I went around last night a couple of times (7 May) and didn't get got, so hopefully it's clear for the moment. Got 1 a few weeks ago as well. I am willing to bet it is one of the houses about half way up the hill just before that little park on the left. Last time I rode there someone was taking flash photos as we passed, either to "catch" us or try to scare riders into thinking it was a speed camera. A heap more cyclists changing tyres this morning, myself included. I think the tacks were somewhere between Yarralea and Honeybadgers hill, heading north. Rode wide, kept out of bike lanes and still got done. 3rd time in 6 weeks. Please report all tack incidents to Boroondara Police on 03 8851 1111. We have been KB riding over the last week and got three flats from tacks in three rides. Clearly a resident with nothing better to do with there time. Perhaps they will feel more remorseful when someone has a serious accident from these tacks. Get a life. Just got done again this morning which is the third time in 3 weeks. To the resident tacking, we won't stop riding KB so get a life. Perhaps you'll feel more remorseful when someone has a serious accident from your tacks. Not sure if this thread is still live - but reporting tack Easter Monday 2 Apr 2018. 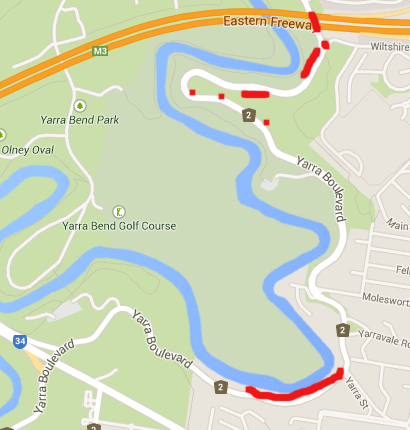 Northbound on Yarra Blvd just past the offramp to Bellbird spot. I met a very nice man named John who explained the situation - I'm relatively new to the scene, thanks for stopping. Four years later and it's still occurring?! World hide and seek champion - The Kew Tack Dropper. I've since moved and haven't ridden that area for a long while. Let's hope their useless tacking campaign stops sometime within the next four years.